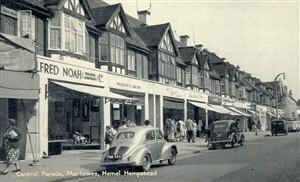 My parents moved to Hemel from Margate in Kent in 1939 when the war started. We lived on the sea front, and enemy shells, which were meant for the docks at Dover, sometimes came out of range and landed in Margate, so hence the move to the country. There were six in the family. I have two brothers and one sister. My father worked for a company whose head office was located in Watford, so I think on one of his visits to Head Office, he decided to look at surrounding areas, with a view to moving until the war ended. I well remember my mother almost crying when we were all driving up to Adeyfield hill to our new house. She had specifically told him not to get a house on a hill as she had one baby in a pram and three young children. Our new house was in Mountfield Road, at the very top of the hill. His answer was it was either that or one in Hillfield Road, which was just as bad! As the years went by and the children started schools, my parents stayed on in Hemel rather than interrupt our schooling, and so it was that in 1951 I was at work at a local solicitors, Messes A. J. Adams and Adams, situated in Marlowes on the corner of Albion Hill. It was a big red building with a large clock on the front; it stood almost opposite King Henry VIII public house. I was employed to work mainly in litigation, but sometimes on conveyancing, a reasonably well paid job for the time, but like all young people, I was looking to earn more money. It was then that I heard the magic words, LONDON RATES. The Commission for New Towns opened an office two doors away from where I worked, in a little parade of former shops, and it was from the girls there that I heard of the businesses which were moving to the Industrial Estate. In the local paper, the Hemel Hempstead Gazette, I read of a Company called Addressograph-Multigraph Ltd who was moving from Colindale, so I decided to pay them a call, having in mind applying for a position of PA to the Sales Director. There were only two people on the premises when I called, namely the ex-Royal Artillery Sergeant on the gatehouse and the Personnel Manager. He explained to me that the office block would be opening later, but would I consider working for him, as the main priority was to get the ‘works’ up and running. This entailed bringing those from the firm in Colindale and housing them and also recruiting others from London who wished to relocate to the New Town. This seemed a lot more interesting than typing wills and deeds, so I agreed to start at a much-inflated salary to my previous job. The LONDON RATES had come up trumps. I was given a very nice office separate from the Personnel Manager and on the first day looking round, I thought I’d made a good move. I remember thinking I would miss the huge coal fire, which was in the solicitors and was so welcoming to come into of a winter’s morning, being lit by the cleaning lady before we arrived at work. I was always called Miss Adams and the Personnel Manager was Mr Maycock, and thus we remained on this formal name basis all the years I worked there. He and I worked as a team, there being no one else to delegate work to, and we soon had a continuous stream of would-be employees to be interviewed. The local people who applied for work were unfortunately not eligible for a house, so there were some extremely frustrated and disappointed people coming and going and not understanding why they could not be housed as their need was just as great as the Londoners’! But rules were rules and only the locals who didn’t need housing were interviewed. Firstly the employees from London came and returned by special coaches, and as the houses became available they were taken to view them by Mrs Penny from the Commission for New Towns. They usually came back to work after viewing, as pleased as Punch as so many were living with in-laws in one room. The prospect of a home and garden was a dream come true. I got so much pleasure from speaking to them afterwards, especially since I’d had a hand in it all. It was like the Personnel Manager and I had wonderful powers to be able to grant their greatest wish, i.e. to be employed and given a brand new house. I’m sorry to say that there were no people of ethnic backgrounds employed at the Colindale factory, and this was also the case at Hemel Hempstead. Nobody of different colour or creed was even allowed past the main gate to apply for an interview. They were told the jobs were filled. Something I am happy to say, we wouldn’t get away with in this day and age. Gradually the works became up and running and because so many of the staff were from the original Colindale factory, it was all very friendly with help and advice in abundance. I think the full complement of works staff was about 500 to start with, and my job also involved interacting with all the various Foremen of the different ‘Shops’ as they were called. I gradually picked up the engineering terms and became accustomed to the distinctive smell of the Machine Shop, with the Capstan and Milling machines, the Drilling Shop, the Platers and Enamellers (where you turned a blind eye to the odd bit of car-part which was smuggled in for plating) and the mind-numbing thud of the huge Henry and Wright press which pressed out the little oblong sheets of metal which were used to stamp impressions of addresses on. You could not hear yourself talk when near this huge press. The Fitting Shop worked to extremely fine limits - to within one thousand of a inch, so the men who worked here were very highly skilled indeed and commanded the highest rates of pay in the works: all of 2s/11d per hour. The whole factory worked piecework; so the more you did, more was earned. Sometimes when the Factory Inspector called unannounced as he usually did, I knew without being told, that I had to do a circuit of the Machine Shop to warn all the Foremen to make sure the guards were on all the machines. So many of the workforce kept the guards off because they could work at a faster pace. A phrase I often heard was that the workers felt like they were a family, as the company looked after them so well. When they moved to their new houses, many had not enough money to buy the essentials, let alone furniture, so the company would just lend them the money they needed – no security, just trust – and it was deducted from their wages each week interest free. When Christmas came, apparently it had been a tradition in Colindale for the men to bring a few beers into the works on Christmas Eve. The Management were very flexible on this, and the men were allowed to leave an hour earlier than normal. The rules were not abused by the men, presumably because the number of employees in London was far smaller than that in Hemel, but the first Xmas Eve this was allowed in Hemel the drink began flowing in the morning instead of the afternoon, so the word got back to the Personnel Manager that men were asleep under their benches worse for drink, so we had to shut the works at lunch-time and give them all the afternoon off. Thereafter all drink was banned on the premises. Next to my office was the Surgery. A fully trained Sister was employed. She wore a blue uniform and a starched cap and it was a beautifully equipped place. She and I became very friendly. On the occasions when she was ill, guess who had to fill in for her! I would hear people walk past my office and know that I had to go in there and do what I could, unskilled as I was. It was factory regulation that the Surgery had to have someone in attendance at all times. Gradually through the years, I was taught by Sister how to fold back the eye-lid with the help of a small wooden spatula so a magnet could be held up to attract the small pieces of metal swarf which had become lodged under the lid and were extremely dangerous and painful if left. I remember having to dress boils, leg ulcers and administer cough and cold mixtures and even lay them down in the rest room with terrible migraines. Once, I had got a man’s eye-lid turned back and was just about to pick up the magnet when he said ‘I’m going Nurse’, I thought, where to? When all of a sudden he flung out his arms and legs knocking the trolley flying, and promptly had a fit. I think I took it all in my stride! Whilst at Addressagraph-Multigraph, the Commission for New Towns asked if we would like to name the road outside, and this task was given to me. I named it Cleveland Road after the location of one of their subsidiary companies in America, at Cleveland, Ohio. It is just off Maylands Avenue. I was very happy working with the Personnel Manager and as the office in the front section of the building was gradually staffed, I had the opportunity to become PA to the Company Director, Mr Carruthers, but by then I was happy staying on the Works side – just as well, because a short while after that, the Personnel Manager had a heart attack and was told he had to take 6-8 weeks rest. Thereafter, I ran the office myself with the help of a young office girl. There were so many things which were just committed to memory - rates of pay, terms and conditions, rules and regulations which normally the Personnel Manager dealt with plus the correspondence. The Engineering Manager popped in once a morning to deal with any complicated correspondence, but we got through it, and I look back now with much affection for the old company. I attend the Retired Club once a month, but the numbers are gradually dwindling, I think it should be renamed the Departure Lounge- Aah! Happy days …….